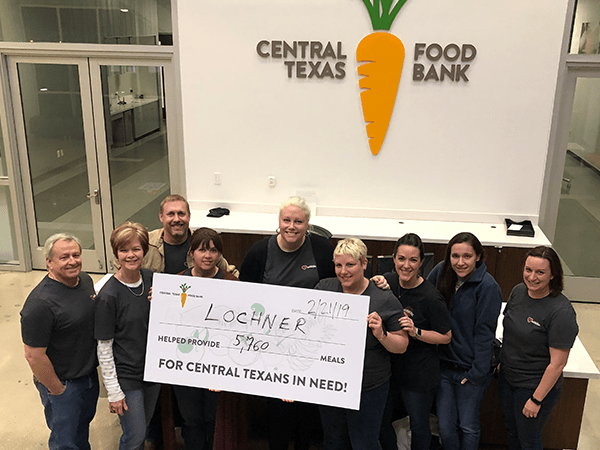 As part of Lochner’s Giving Back Initiative, employees throughout the firm participate in an annual group service project that benefits the local communities in which they live, work and play. This week, we are featuring the volunteer efforts of our Austin, Texas, office at the Central Texas Food Bank. On February 21, employees sorted, weighed, and bagged fresh produce—including potatoes, onions, and carrots—and compiled them into “stewies” for Central Texans in need. They processed 6,710 pounds of produce and created 5,760 meals for the community. The Central Texas Food Bank began in 1982 with the mission to nourish hungry people and lead the community in the fight against hunger. They do so in three key ways: sharing free food and knowledge on low-cost, healthy eating with families in need; assisting families who qualify for federal assistance; and making food affordable for charitable and government programs, allowing them to enhance the spend of their limited resources. Roughly 250 partner agencies support the Central Texas Food Bank to serve families in 21 Central Texas counties at soup kitchens, food pantries, after-school programs, snack programs and other service sites.